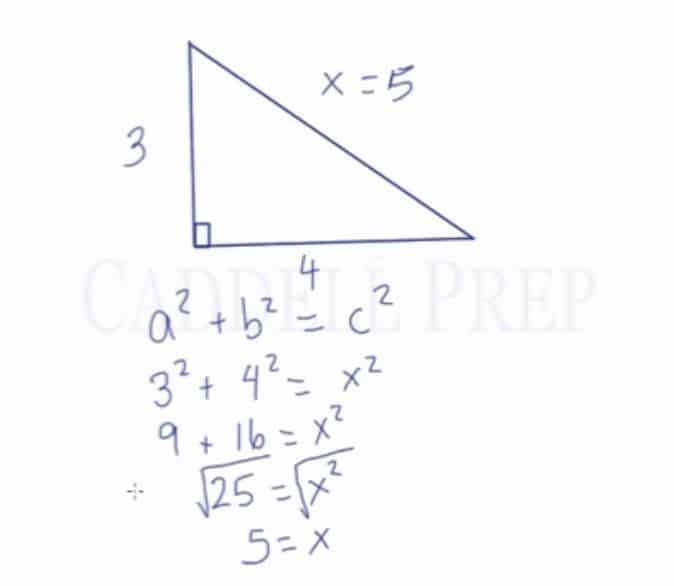 In this video, we are going to look at how to find a missing side length of a right triangle by using the Pythagorean Theorem. and c is the length of the hypotenuse. In this lesson, we’ll discuss the Pythagorean Theorem. It’s very important to note that Pythagorean theorem is only for right triangles. You can not use this theorem in other types of triangles. A right triangle has a angle. Let’s go over some terminologies first. The side opposite of the right angle is called hypotenuse. The other two sides are known as legs. Given this right triangle, there is an equation that relates the measurement of the legs to the measurement of the hypotenuse. Where hypotenuse is and the legs are and . As for the legs, it doesn’t matter which side you put in as or . It’s your call. This equation is called the Pythagorean theorem. Let’s have an example and put this equation to work. Here’s a right triangle with a vertical leg measuring and a horizontal leg measuring . And the hypotenuse is unknown or . Again, as it doesn’t matter which leg is or . Let’s just pick the vertical leg to be and the horizontal leg to be . To solve the value of , we have to do the inverse operation which is squareroot.